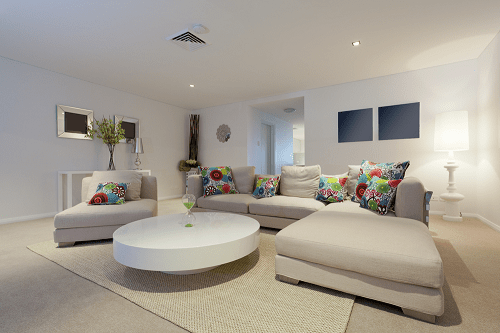 As with any major home improvement project, a basement renovation can be a daunting undertaking. The more you understand your renovation goals, and the materials, tasks and money it will take to get them done, the more successful the finished project will be. 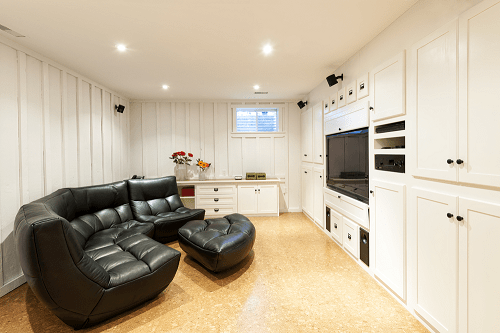 The following list outlines some of the basics that go into planning a basement renovation, to help your own project get off to a great start. A detailed project plan and budget will keep your renovation in line. Whether you’re completely finishing a basement or simply getting it waterproofed, it’s important to have a clear outline of your basement specs, design goals and dedicated budget. After budgeting for the general renovation, break down allocated money by smaller projects. This will help you understand where you might need to reduce spending (or splurge) on certain aspects, and prioritize if cuts need to be made. There are plenty of DIY basement projects out there for the budget-conscious homeowner, or for those who like to be handy around the house. Adding insulation and hanging drywall, for instance, are great projects for the more experienced, while painting can be managed by even the most novice of homeowners. 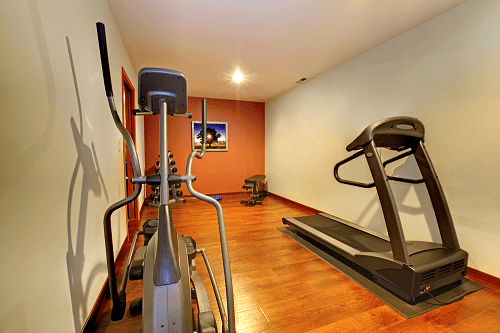 Alternatively, many basement projects will require a professional contractor’s experienced (and licensed) hand. Plumbing, electrical work and HVAC work are just a few projects best left to a basement renovation pros. 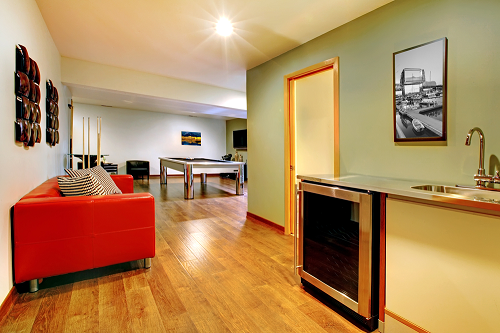 For initial inspiration, begin by browsing pictures of basement renovations. Keep a file of your favorite photos, and take note of the similarities in those you like the most. Scope out pictures of basements with layouts and features similar to yours, so you can more clearly visualize how certain designs would seem in your own home. 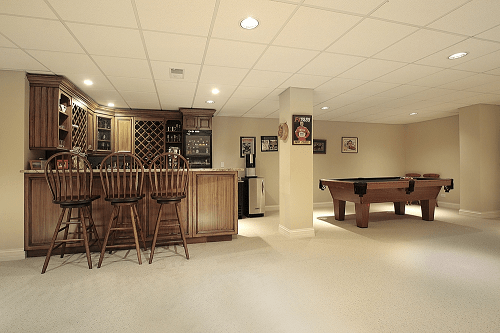 Understanding basement construction material options and pricing is key. No matter which route you take – that is, DIY or contractor – you’ll need to get familiar with the basic materials and supplies that go into a basement renovation. Of course, if you’re completing a project yourself, you’ll be the one buying products; and when working with a basement contractor, you’ll need to make educated design and budget decisions. Insulation. Insulation in basement serves dual purposes: it controls the ambient temperature, and adds an extra layer of moisture control. (Basements are naturally damp environments, a detail that will affect many of your design choices.) Many homeowners insulate both their basement walls and ceiling. When installed in the basement ceiling, insulation also helps serves as a noise control. Drywall. Drywall is one of the most common materials used in home construction. It is available in sheets, which are hung to create flat wall surfaces. To finish a wall, joint compound is then added to the seams between drywall sheets, when are then sanded and sealed with primer before painting. Drop ceilings. Drop ceilings are popular choices for many finished basements. Also known as a suspended ceiling, a drop ceiling is characterized by removable tiles, which conceal electrical, plumbing and HVAC materials. Keep in mind that this style of ceiling cuts into the amount of space overhead, so it’s a better option for basements with already comfortably tall ceilings. Water-resistant flooring. As mentioned above, basements are prone to moisture and leaks, which means certain flooring options used otherwise throughout the house are not suitable for the basement. Carpeting and traditional hardwood floors, for example, do not hold up well to dampness and water damage. On the other hand, ceramic and vinyl tile, laminate and engineered wood flooring are all good options for basement renovations. Even poured concrete can look industrially chic when cleaned and stained professionally. 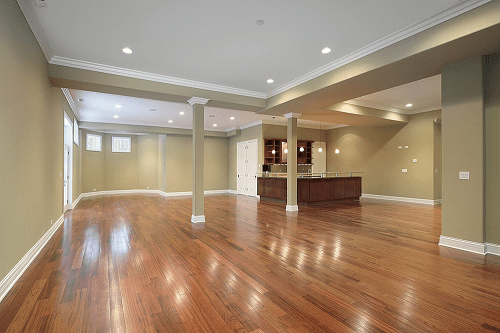 A dry, waterproofed basement will keep any remodeling projects looking great for years. To keep your basement looking its best, it’s smart have it professionally waterproofed before beginning a renovation or remodeling project. If you’ve already noticed signs of water issues (like puddles in your floor or water drips seeping through the walls), you’ll definitely want to call in a pro. Some water issues are related to a house’s foundation, so check for cracks and repair any damages as necessary. Basement waterproofing encompasses a broad range of services, with solutions both reactive and preventative. Services include installing sump pumps, installing floor drainage systems, repairing damaged or improperly aligned gutters, and sealing foundation cracks. Vapor barriers are another important consideration when it comes to maintaining a comfortable and dry basement environment. A vapor barrier helps limit the diffusion of any water vapors in the air into your basement walls (and thus helps limit mold and rot). These can be added to floors and walls, before finishing either surface. Some basement renovation projects require permits. Don’t assume that you can just jump in to any renovation or remodels you like. Many home improvement projects require permits, like electrical and plumbing work, which will have to be inspected when completed. Check in with your local municipality to see what projects have specific regulations. Bedrooms, for example, will have ceiling, window and egress requirements. It’s important that you don’t skip the permitting process. If caught, you may have to rebuild from scratch – and in the future, you’ll have trouble selling your house without the proper paperwork. If you hire a professional contractor for a project that requires permitting, he or she will help guide you through the procurement process. 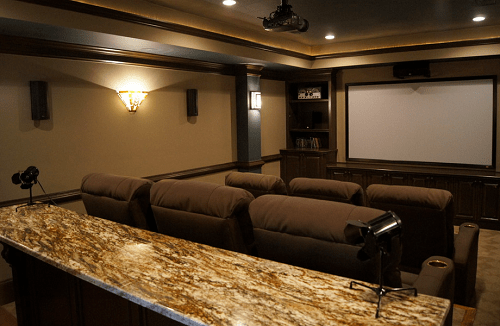 Renovating your basement can be a fun and empowering process, whether you are rolling up your sleeves for a DIY project or overseeing a professional remodel. And with a little due diligence and patience, you ensure your next home improvement is a worthy investment.